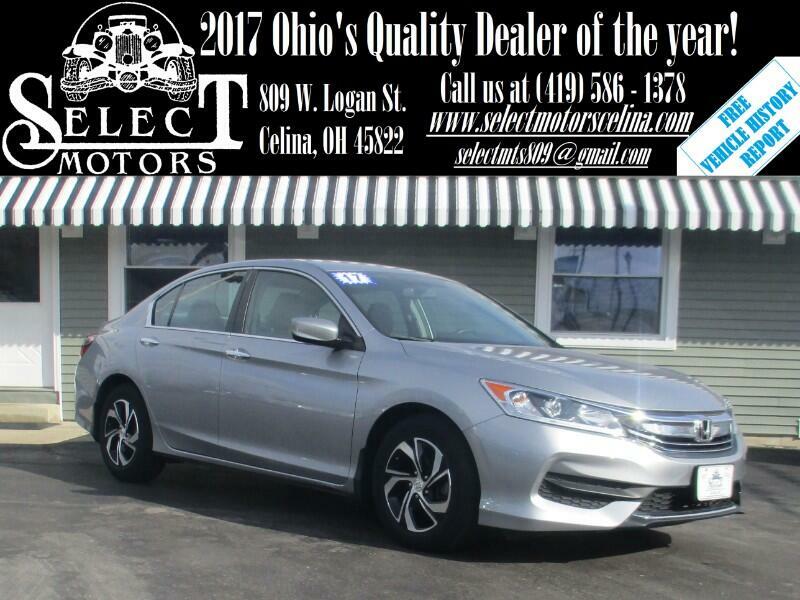 ***TXT US @: (419) 362 - 6200*** Backup camera, automatic headlights, Bluetooth, outside temperature, A/C. dual automatic climate control, power windows/locks/mirrors, keyless entry, AM/FM, auxiliary and USB port, steering wheel mounted audio controls, tilt and telescopic steering wheel, cruise control, information center, 16" alloy wheels. Fuel Economy: 27 city / 36 hwy. Warranties: Balance of Honda's 3 year or 36,000 mile bumper to bumper and 5 year or 60,000 mile powertrain. In service date: 04/28/2017. Extended service contracts available. The front-wheel-drive 2017 Honda Accord is available in two body styles. Sedans come in LX, Sport, Sport Special Edition (Sport SE), EX, EX-L, EX-L V6 and Touring trims. Coupes are available in LX-S, EX, EX-L, EX-L V6 and Touring trims. Upgrading from one trim to the next gets you more features, and we think the associated price bumps are appropriate given the upgrades you get. A suite of advanced safety systems called Honda Sensing is available on all trims except Touring (where it's standard), but our lackluster experiences with this system make it difficult to recommend. Starting with the sedans, the base LX is quite generously equipped and powered by a 2.4-liter four-cylinder engine (185 horsepower, 181 pound-feet) paired to a six-speed manual transmission or continuously variable automatic transmission (CVT). Feature highlights include 16-inch alloy wheels, dual-zone automatic climate control, a 7.7-inch central display (not to be confused with the touchscreen that's added on higher trims), Bluetooth, a rearview camera, a height-adjustable driver seat, a one-piece folding rear seat and a four-speaker sound system. Opting for our favorite, the Sport, gets you a bit more power (189 hp, 182 lb-ft), 19-inch wheels, LED daytime running lights and foglights, cloth seating with imitation-leather bolsters, a power driver seat, a 60/40-split folding rear seat and a leather-wrapped steering wheel (with shift paddles if the automatic transmission is specified). The Sport Special Edition is very similar to the regular Sport, but it adds special-edition badging, heated front seats and leather seats with red accent stitching. The Accord EX also builds off the LX, but it focuses more on extra amenities than sportiness, adding 17-inch wheels, LED daytime running lights and foglights, heated mirrors, a sunroof, keyless ignition and entry, remote ignition (with the automatic transmission), the power driver seat,Honda's LaneWatch blind-spot camera system, a six-speaker sound system with a 7-inch touchscreen interface (the standard 7.7-inch display remains as well) and satellite and HD radio. Also standard is smartphone app integration via HondaLink (with smartphone-enabled Aha radio features), Android Auto and Apple CarPlay. The EX-L trim comes with the CVT and adds leather upholstery, driver-seat memory functions, a power passenger seat, heated front seats, an auto-dimming rearview mirror and an upgraded seven-speaker sound system. As its name suggests, the EX-L V6 is powered by a 3.5-liter V6 (278 hp, 252 lb-ft) matched to a six-speed automatic.